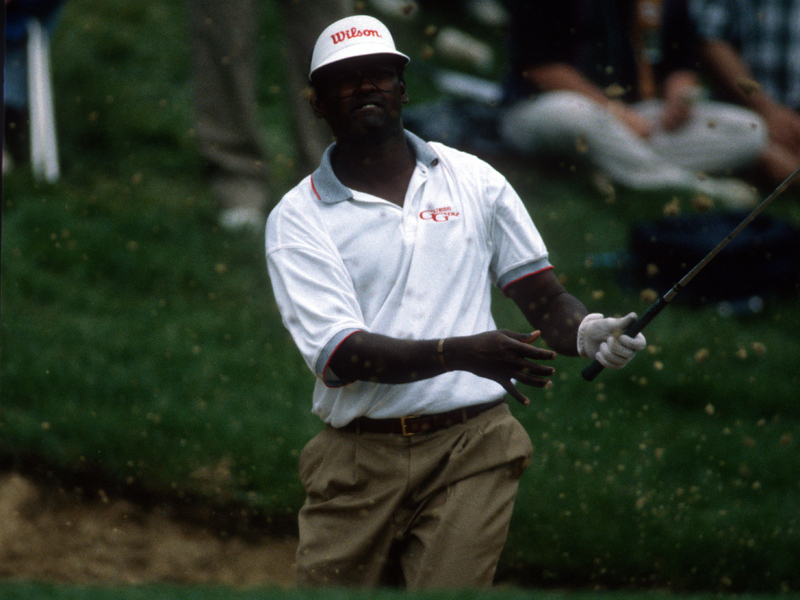 In the end, the 1997 Memorial Tournament may be remembered for its many great golf shots or its genuine mad dash to the finish or its terrific champion - Vijay Singh of Fiji - whose name means "victory" in his native Hindu language. But for all involved the most lasting memory may have been the extra measure of patience, perseverance and persistence it took to make it to the end. Early in the week, all eyes were focused on two competitors, neither of which was eventual champion Singh, tournament host and founder Jack Nicklaus or defending champion Tom Watson. Instead, it was the twosome of Tiger Woods and John Daly who had the media center buzzing and helped produce record crowds during the early week practice rounds. Woods rode into the Memorial on a wave of dominance that included, in his previous three outings: his historic, record breaking victory at the Masters; following a four week hiatus, another win at the Byron Nelson; and, the week preceding the Memorial, a near miss on the final day at the Colonial. And the only thing to surpass the excellence of his recent play on the golf course was the feverish level of his popularity off of it. Interest in Daly was driven not so much by his recent play, but conversely, his lack thereof. He arrived at Muirfield Village Golf Club fresh out of alcohol rehabilitation, which had kept him away from the PGA TOUR since March. Equipped with a new outlook on life, a new equipment deal and the same go-for-broke swing which had so endeared him to the golfing public, Daly was eager to begin anew and intent on proving his skeptics wrong one final time. Once play began though, the attention quickly turned to golf and, more specifically, the players who were best able to endure the chilly, rainy conditions of Thursday's first round. Four players, Billy Andrade, Glen Day, Tim Herron and Jesper Parnevik, all credited a familiarity with wet, cool weather in shooting six-under-par 66's to share the lead after round one. For Day and Parnevik, the weather was a flashback to their days on the European Tour, where, as Day described with a wink and a smile, "this would be a great day in Scotland - people would be sunbathing." As for Herron, a Minnesotan, and Andrade, a New England native, both mentioned how their northern roots had prepared them for all sorts of weather. Although the second round was played under similar conditions, these four were passed by a competitor quite familiar with success at the Memorial. Scott Hoch, who set the Memorial's 36-hole scoring record in leading after two rounds in 1987 and has survived the cut in all 17 of his appearances at Muirfield Village, assumed the lead at 12-under-par with a second day score of 65. A birdie on the par-four eighteenth left him two shots better than Tommy Tolles, who had finished the day with a sterling bogey-free round of 64. Also lurking close behind was Singh, whose two-day total (70-65=135) left him only three strokes off the pace. Then it was Mother Nature's turn to intervene. In anticipation of large amounts of forecasted rain, Saturday's tee times were moved up and players were grouped in threesomes - rather than the typical twosomes - and sent off both the first and tenth tees. The goal was to complete the third round before rain arrived in Central Ohio. Less than two hours after the first tee time, play was suspended for 80 minutes. After a diligent effort by the Memorial greens staff to ready washed out bunkers and saturated greens, play began again at 11:40 a.m. Twenty-five minutes later, after more steady rain began to fall, play was canceled for the day. The leaders were able to complete just three holes. Although Hoch bogeyed two of the three, he maintained a one shot advantage over his playing partners, Tolles and Singh. Ideally PGA TOUR Officials planned to resume play at 7:30 a.m. on Sunday, completing the third round in the morning and playing the final round that afternoon. Ben Nelson, the TOUR's on-site tournament director was not optimistic; as he put it, "the forecast is not a very pleasant one." Unfortunately, his feeling was not unsubstantiated. Still more heavy rain Sunday morning delayed play once again, but, after another Herculean effort, the greens staff was able to prepare the course for a 2:30 p.m. re-start. This time the leaders were able to complete seven holes before play was again suspended due to more precipitation. At the time, Hoch and Singh were tied at 12-under par, one shot ahead of the hard charging Greg Norman, who stood on the 15th tee in search of a fifth birdie in a row when the horn sounded to halt play for the day. With the suspension came the decision that the tournament would be a maximum 54-hole event and, if play could not be completed on Monday, the title would revert to Scott Hoch, who held the lead after 36 holes. Ironically, it was Norman, now in position to become the Memorial's first three-time champion, who won the only other rain shortened Memorial in 1990. Singh, however, had driven perfectly on the par-five 11th just before play was suspended and had the entire evening on Sunday to ponder his strategy heading into Monday's sprint to the title. For Singh, a night of preparation paid off. He was able to stop the 231-yard shot within 18 inches of the pin using a three wood. Singh simply described the shot by saying, "it came out like a dream." For Hoch, the first swing of the day was less like a dream and more like a nightmare when he wrenched his back. Singh watched Hoch save par before calmly tapping in his putt for eagle and a two shot advantage over both Hoch and Norman, who picked up where he left off on Sunday by birdieing the 15th. That is where Norman's heroics ended. He missed birdie putts on each of the last three holes and settled for a valiant third round 64 and a tie for second place. For Hoch and Singh, the race was still on. Despite a painful back, Hoch was able to post back to back birdies on holes 14 and 15 and stood on the 16th tee just one shot behind Singh, who had also birdied 15. Hoch made a devastating double bogey on the par three 16th, unable to clear the lip of the rear bunker on his first attempt. Despite a bogey on the 17th, Singh was able to par the 18th hole to secure the victory. Singh, who has won in over 12 countries, called the Memorial the most significant of his victories. "It's a big tournament. It's Jack's tournament," said Singh upon being presented the traditional Memorial Tournament crystal.